You should have clicked on the link to Kchat knowing full well what I was going to write about today. I mean, it is seriously the opposite of a secret as to how much I love The Rose. What exactly is there not to love about four incredibly attractive, insanely talented, self-producing musicians with perfectly balanced vocals and just enough quirky charm to make them seem relatable and real?? I have met a total of zero people that haven’t fallen for them immediately. Or at least don’t get angry when I put a single song on repeat for ten to twenty times while making pancakes. It could be they’re just trying to keep me happy so they get the pancakes. The Rose released their second EP, Dawn, on October 4 to much anticipation and fanfare…from me and mine anyway. I assume from other people too, but I’ve been pretty busy and not really paying attention. The only thing I don’t like about the release is that it only increases their catalog by like four songs. FOUR! How is that in any way enough? It, in the words of the insightful LizC, fully delivered on the promised emo. Alex’s review echoed the sentiment with a ‘The Rose is beautiful and oh so angsty.’ It’s everything we expected and needed. 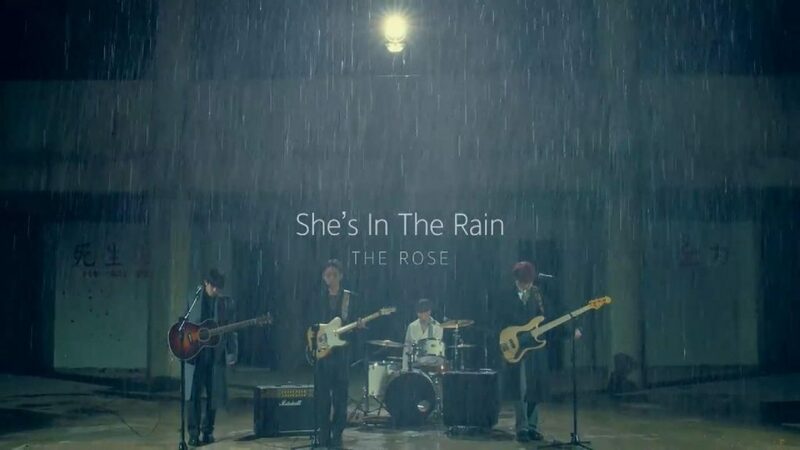 The video for the title track, She’s in the Rain, is super reminiscent of Sorry, their debut song, but with a more obvious storyline and actors playing the parts of the bittersweet couple. The styling is on point, the dilapidated building is the perfect setting, and oh, the rain. Teenage me is so so satisfied. Adult me is hugging teenage me and telling her that it’s pretty accurate as far as loving the bad boy goes. AND I LOVE EVERY SECOND OF IT. Alix may have indulged or enabled me by tacking on my pre-order of the EP to her Ikon pre-order and we’ll be getting these delicious treats in a couple of weeks. I. AM. SO. EXCITED. FOR. THE. PHOTOS.